Improve your stamina, burn calories, increase muscle tone and improve your overall fitness without compromising on space or quality with the DKN R-320 rowing machine. 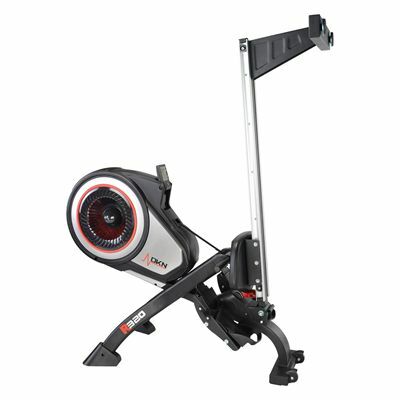 The R-320's air resistance mechanism utilises a turbine fan at the front of the rower to generate wind resistance. The step-less gear system determines the amount of resistance based on your pace. There's a resistance lever positioned between the feet that increases the friction on the fan, so the harder and faster you pull, the higher the resistance. This system is incredibly responsive and delivers a smooth, vibration-free action so that you can always train at exactly the pace and difficulty that you want, instantly. Plus, the effective travel distance is 1100mm along the rail, delivering a more real-life rowing experience. 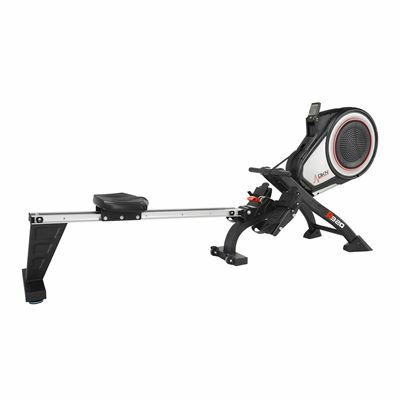 The R-320 has been built with serious use in mind, and with a 130kg maximum user weight limit it's robust, making it suitable for heavy rowing sessions and a wide range of users from beginners to advanced fitness enthusiasts. Also featured are large pedals with adjustable foot straps, a comfortable seat with ergonomic design and foam grip handles to ensure a firm, comfortable grip. In addition to looking stylish and modern, the R-320 also features a folding mechanism that ensures easy storage, making it suitable for just about any home. 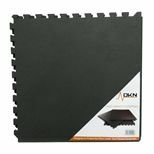 Last but not least, the R-320 comes with DKN's on-site 2 year parts and labour warranty for your complete peace of mind. for submitting product information about DKN R-320 Rowing Machine We aim to answer all questions within 2-3 days. 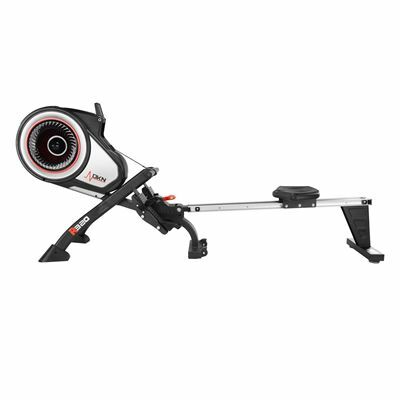 for submitting product information about DKN R-320 Rowing Machine. We aim to answer all questions within 2-3 days. If you provided your name and email address, we will email you as soon as the answer is published. Yes, this space-saver offers vertical storage. It also comes with 2 integrated caster wheels enabling you to move it around quickly and effortlessly. How does the air resistance system work? The rower uses only air as a resistance mechanism which means that the amount of resistance is based on your pace. You increase or decrease the resistance according to your own efforts, and therefore have a lot less chance of overdoing it or injuring yourself. What is the maximum distance that the seat travels from front to back? 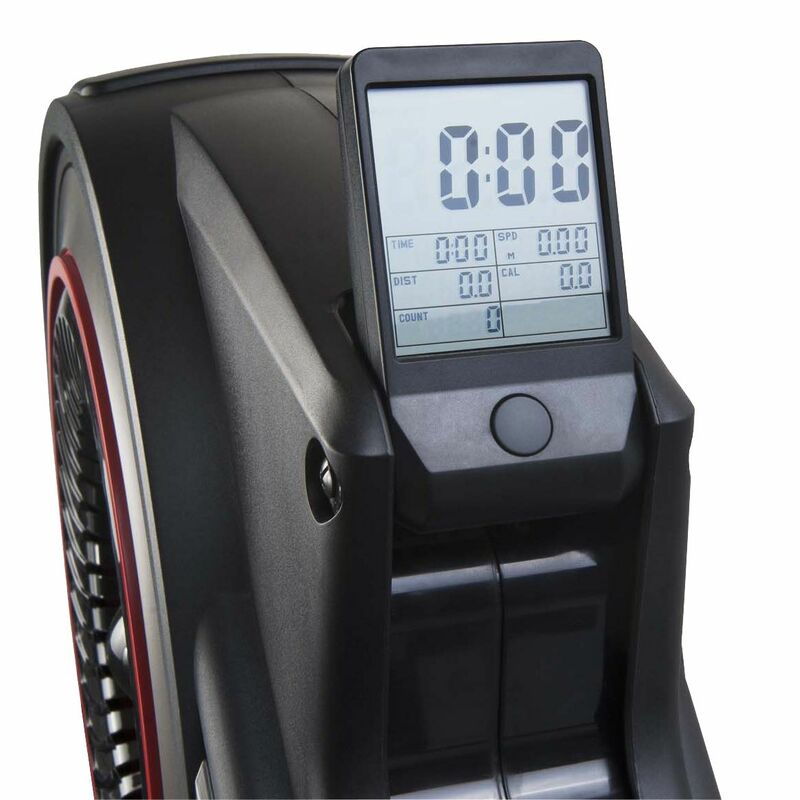 The R-320 has an effective travel distance of 110cm (43.3'') which makes it suitable even for taller rowing enthusiasts. Is the machine suitable for someone my height? I am 6'2" tall. Yes, it is perfectly suitable for you. Depending on postcode delivery is between 1 and 3 working days when this item is in stock. Please check above the buy button to see if it's on stock, or whether we're expecting more to be with us shortly. The main noise this rowing machine makes is generating by the turbine fan. It's not silent but it's not particularly loud either. Does this rower have a wireless heart rate receiver? Hi. This model does not have a heart rate receiver. If monitoring your heart rate is important to you we'd recommend considering a sports watch with chest belt such as the Polar FT1 heart rate monitor that will provide you with a very accurate heart rate reading as well as a wealth of other workout feedback. Smooth, vibration free movement. I can feel all muscles being worked. Good piece of kit. Would recommend to first time users like myself. 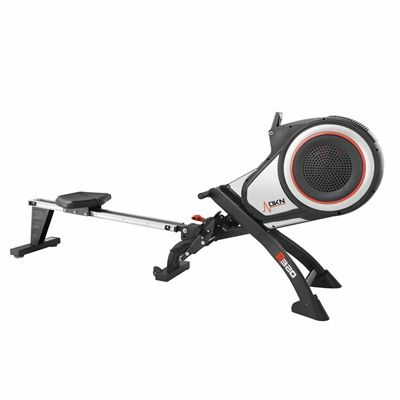 Bought this after checking out several reviews of rowing machines. Good, robust product. Sturdily made and easy to put together. Arrived on time. Assembly was a breeze. Straightforward and easy to use. Nice addition to my home gym. Very fast delivery. It works great for the price. 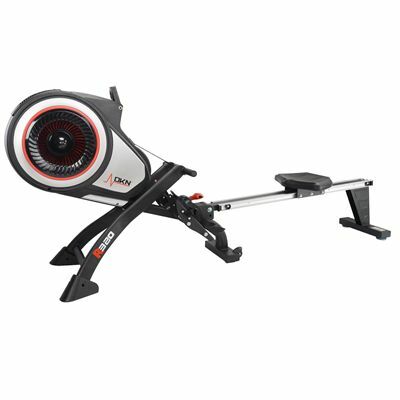 Would happily recommend for anyone looking for a low cost home rower. Easy to assemble and very reasonably priced. I look forward to the new me! Wasn't fun putting it together but then it never is with these things. Other than that the rower's great. I've been using it 5-6 days a week for 40 minutes at a time. It's quite noisy because of the air resistance but very smooth at the same time. 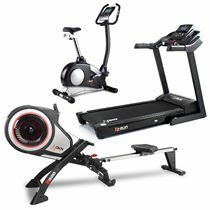 Provides a good challenging workout and is built really well. Happy with my choice on this and as long as you accept that it's not silent (neither are concept machines btw) I would recommend it. It's a lot of rowing machine for the money imo. This rower has a great action. I'm 6ft 2 and find it really comfortable. It's smooth and has plenty of resistance to make it challenging. Worth the money for sure. 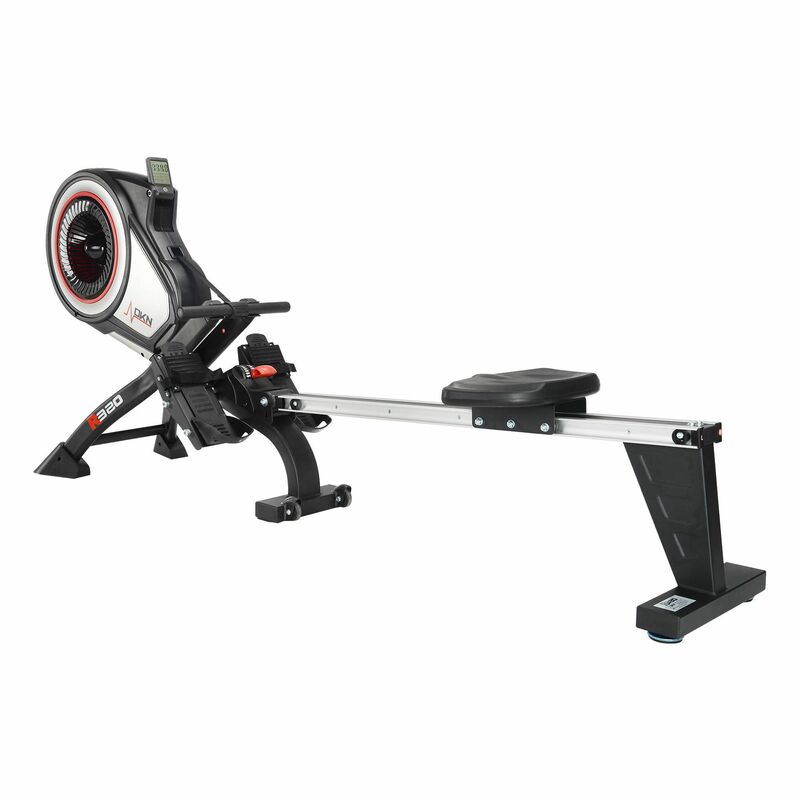 This isn't my first rower and I can tell you that it compares very well with others I've used that cost the same as this. Took us 2 hours to assemble it though so marking down 1 star as think this should have been easier to put together. Love the rower itself though. Great piece of kit! This is a great rower! A lot more sturdy and solid than I had expected and gives a really good workout. Have already recommended this to friends. for submitting product review about DKN R-320 Rowing Machine.